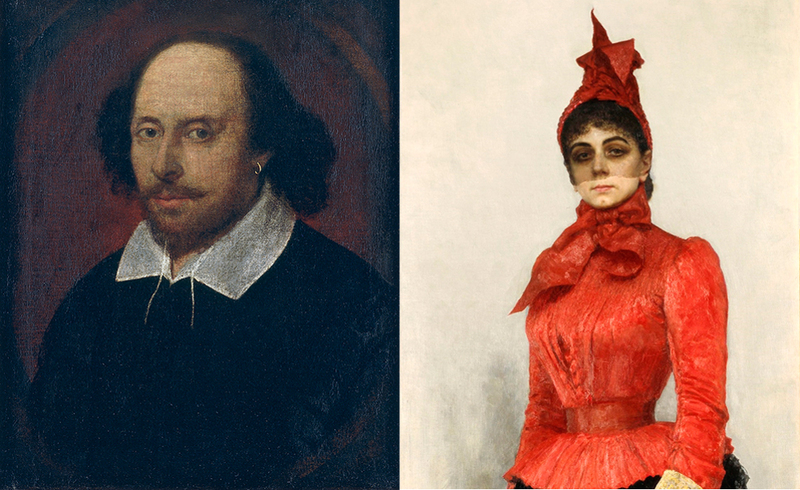 Portrait of William Shakespeare by John Taylor(L), Ilya Repin. Portrait of Baroness Varvara Ikskul von Hildenbandt. London’s National Portrait Gallery and Moscow’s Tretyakov Gallery are sending each other portraits of their respective countries’ national elites as part of a double exhibition to commemorate the museums’ 160th anniversaries. As London’s National Portrait Gallery and Moscow’s Tretyakov Gallery prepare to mark big anniversaries, the two art museums are packing up part of their collection in readiness for a commemorative exchange exhibition. This year the two galleries mark the 160th anniversary of the foundation of their collections. While a total of 49 masterpieces are being taken down from the walls of London's National Portrait Gallery to be flown to Russia, 26 portraits from the Moscow museum are on their way to Britain’s principal portrait gallery in Trafalgar Square. Visitors to London will be able to enjoy the exhibition “Russia and the Arts: The Age of Tolstoy and Tchaikovsky” at the National Portrait Gallery from March 17- June 26, while “Elizabeth to Victoria: British Portraits from the Collection of the National Portrait Gallery” will be on show at the Tretyakov Gallery in Moscow from April 21 – July 24. “There are many portraits that haven't traveled for ages and do it very rarely, and that have never been abroad, such as [Vasily] Perov's portrait of Dostoevsky, [Nikolai] Ge's portrait of Tolstoy, works by [Mikhail] Brubel and [Valentin] Serov,” said Zelfura Tregulova, director of the State Tretyakov Gallery. All the Russian portraits feature the country's most influential figures from the 19th-early 20th century – people who are not only the pride of the nation, but also played a significant role in world culture and politics. According to the Tretyakov Gallery's deputy director for scientific affairs, Tatyana Karpova, and the exhibition's curator, the negotiations between two museums started in 2012, as the exchange exhibitions were planned for the UK-Russia Year of Culture in 2014. But the British side plans loans of its artworks long in advance, so the show was postponed until this year. “I think now the exhibitions won't be just one of the numerous events of the cross-cultural year, but will be even brighter in the UK-Russia Year of Language and Literature, partly because a large part of the portraits are of famous writers,” said Karpova. “The portrait tradition in Russia is two centuries younger than the British one and even in the 19th century it's still more connected with icon tradition, while in British paintings the subjects pose more freely,” she added. Besides Tolstoy, Dostoevsky, Chekhov, and Akhmatova, London will see images of some of Russia’s best-known composers, such as Tchaikovsky, Mussorgsky, Rimsky-Korsakov and Rubinstein, as well as art patrons like Ivan Morozov and Savva Mamontov. And of course, the show will also feature a portrait of Pavel Tretyakov, the man who 160 years ago began to collect the art masterpieces that would serve as the foundation of the Tretyakov Gallery’s collection. Tretyakov visited London several times during his life and witnessed the beginnings of the National Portrait gallery's collection. Portraits of Queen Victoria, Oliver Cromwell, James Cook, William Shakespeare, Robert Burns, and Charles Dickens will be exhibited in Moscow. The show will be accompanied by an educational program, with lectures and film screenings. Detailed print catalogues will be released for each exhibition.